Last Week Today: San Antoni-oh! With a demanding schedule have come satisfactory results. 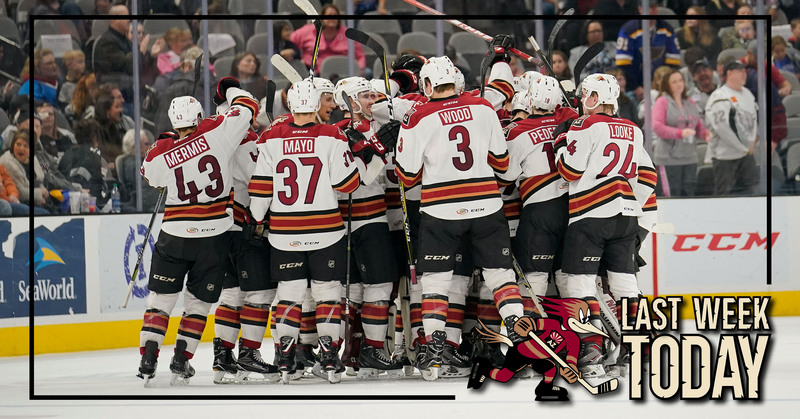 In playing four games over a six-day stretch during the past week, the Roadrunners earned six of a possible eight points in putting a respectable cap on a string of 28-consecutive intra-division games – a run that began on November 10, and one they finished with a 16-11-0-1 record. 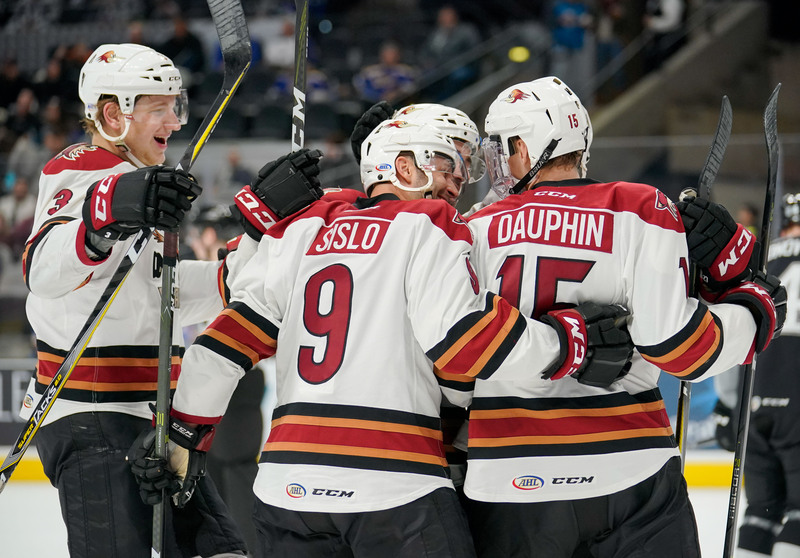 The week began with a pair of games against the San Diego Gulls on home ice – a two-game set which the Roadrunners split, winning by a 5-3 score Monday night and falling by a 5-3 score on Wednesday morning. San Antonio was the weekend destination, the Roadrunners making their only trip of the season to the AT&T Center for a pair of games played Friday and Saturday. Friday night’s 2-1 overtime victory over the Rampage saw the team set a new franchise record for shots in a game, totaling 55. Mario Kempe scored the game-winning goal 3:07 into the extra frame. The Roadrunners almost replicated Friday night’s win on Saturday – again earning a 2-1 overtime victory, and again heavily outshooting the Rampage. Lawson Crouse netted the game-winning goal 0:39 into overtime. The Roadrunners outshot the Rampage by a total count of 87-38 during the weekend. The team’s .765 win percentage (12-3-1-1) on the road this season is now the best in the Western Conference and second overall in the league. Hunter Miska won both of his starts during the week. His 12 wins are tied for the second-most among rookie goaltenders. He is now a perfect 4-0 in overtime games this year, and a perfect 6-0-0 on the road. Mike Sislo, with points in all four of the team’s games during the week, extended his team-leading points streak to seven games. He’s totaled eight (2G, 6A) during his current run. Brendan Perlini tacked on a pair of goals during the week, upping his season total to 12, finding the back of the net Thursday night against the Nashville Predators at Bridgestone Arena and on Saturday against the St. Louis Blues at the Scottrade Center. Christian Fischer registered two points (1G, 1A) in the Coyotes' rout of the St. Lous Blues Saturday night, including the team’s fourth goal of the evening when he deflected a Jakob Chychrun shot past Jake Allen. Driving to the net to receive a pass from Jens Looke from the right half-boards, Mario Kempe shimmied to beat San Diego’s Reto Berra with a slick move to his backhand to give the Roadrunners a 2-0 lead in the club’s eventual 5-3 loss to the Gulls Wednesday morning at Tucson Arena, scoring his fourth goal of the season.